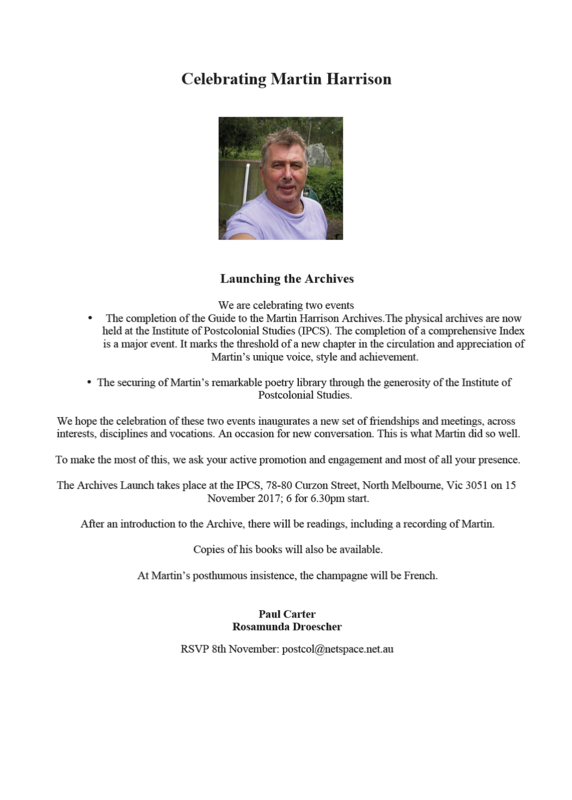 The Institute of Postcolonial Studies (IPCS), situated in North Melbourne, is hosting a launch of the complete guide to the Martin Harrison Archives and the preservation of Martin’s poetry library. Martin, who died in September 2014, was a most generous inaugural editorial board member of Plumwood Mountain journal and mentor and friend to many poets and poetry-lovers throughout Australia including members of our editorial board. For the first anniversary of Martin’s death Peter Minter and Stuart Cooke curated a special issue of the journal honouring Martin. I am sure many poets and readers of Plumwood Mountain will be keen to attend the launch of this important index to the Martin Harrison Archives and his poetry library at IPCS on 15 November 2017. RSVP postcol@netspace.net.au by 8 November 2017.